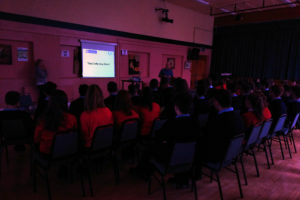 Thanks to Emmet Major of the Western Regional Drug and Alcohol Task Force, accompanied by local gardai and the local Junior Liaison Officer, who came last Friday to talk to all students receiving their Junior Certificate results. He delivered the excellent “Stay Safe, Stay Sober” presentation . This is part of the policing effort that goes into making Junior Cert night safer for everyone. Hopefully their advice will be of benefit to our students in keeping them safe.